The final 2016-2020 L.A. County Strategic Plan for Economic Development has been released and is now available. Public input was critical to the plan’s development. During 2015, the LAEDC engaged and elicited input from more than 500 stakeholders in 26 public input sessions that brought together leaders from the public, private, business, government, labor, education, environmental, and community-based organizations to build consensus around shared goals and effective strategies. 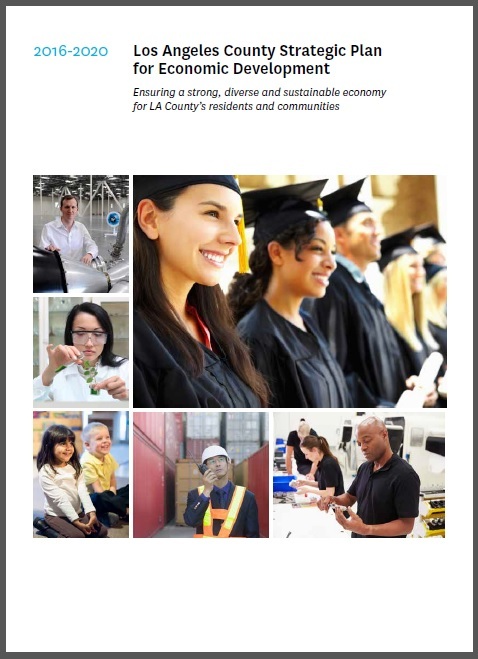 The result is our region’s collaborative, consensus “blueprint” for a strong economy, that defines priorities and actionable strategies to foster creation of well-paying jobs, help our key industries and workforce succeed in these times of change, and increase shared prosperity and standards of living for our diverse residents throughout L.A. County. Read or download the plan HERE. Read the motion that was approved 1/5/16 by the L.A. County Board of Supervisors, as the County takes action on the plan, HERE. Read the newspaper coverage in San Gabriel Valley Tribune (LANG Newspapers) HERE. Read KPCC radio’s coverage HERE. VISIT THE HOME PAGE for the strategic Plan to learn more and get involved in the implementation, HERE. Printed versions of the Strategic Plan are now available. To receive a copy, please email [email protected]. Special Thanks to JPMorgan Chase & Co. and the Morgan Family Foundation, whose generous funding made the Strategic Plan for Economic Development possible!